It was at a Local Petstore (LP), where I first saw a live tarantula. Being the animal lover that I am, and seeing the uniqueness of the animal, I purchased one. I had no knowledge of the animal. When I first observed the tarantula in a molting position, on its back, I thought it had died. The next day I observed, what I thought was two tarantulas in the cage. I couldn't figure out how another tarantula got in the cage. After calling my family to see what I had discovered, I observe that the supposedly mysterious phantom T was actually skin. That was back in the mid eighties (80's). The pet store didn't have a book on tarantulas care. Information on tatantula care was rare in those days. I later learned that when a tarantula is dying, the body posture is in a different position then when it is molting. The legs of a dead tarantula are tucked underneath its body and the tarantula is upright. In order for a tarantula to grow it must go through a process called molting. Molting (ecdysis) is when a tarantula sheds its old exoskeleton (skin). There are certain signs of an upcoming molt. 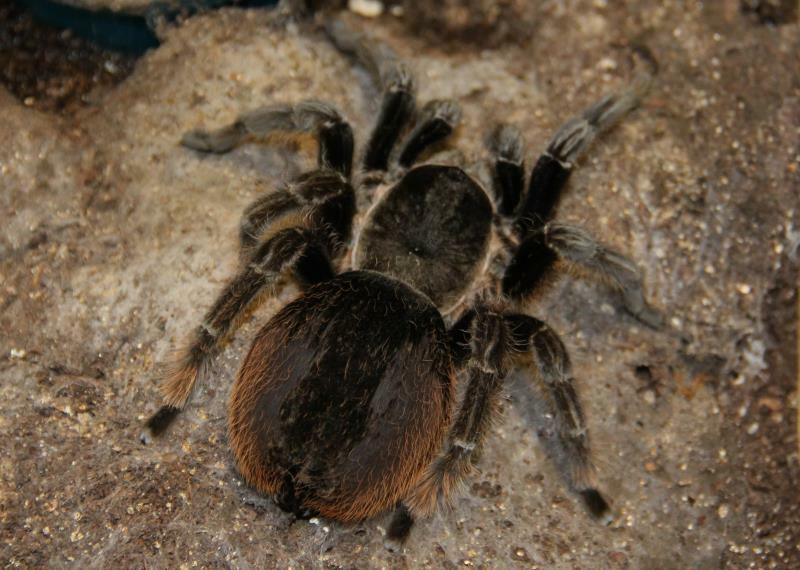 If the tarantula is a juvenile or an adult, it will stop eating prior to molting. When this is observed all feeding should cease. Water should always be available during this time. I have fed spiderlings up to the day before it molted, but sub-adults may begin fasting several weeks before the molt. My large Theraphosa species stopped eating for three (3) months prior to molting. The animal will become inactive, and the abdomen will become bald and turn very dark to black, with most New World species; this is the new skin growth under the old skin. If they have a burrow, most will entrench themselves in their burrow and block the entrance, especially Old World burrowing species. Most Old World and arboreal species don't show the dark abdomen when near a molt. The "T", will also spin a thick silk molting mat. Species with urticating hair may spread these hairs on top of this silken mat. Again, make sure that all food is removed from the terrarium. A tarantula is most vulnerable during the molting period. Even a small cricket can do damage to a molting or freshly molted tarantula. When I observe an approaching molt I normally wet one-half (end) of the cage to increase the humidity. Higher humidity seems to help in the molting process. Molting, I believe, is the most stressful time of a tarantula’s life. It may take an adult tarantula up to eight (8) hours to complete a molt. This is a prayerful time for me. I have lost more tarantulas during or after a molt than any other time. I believe that in the wild, this is how most tarantulas die, instead of predatory death. When the time comes for the molt to commence, the tarantula usually will molt lying on its back (carapace). It is imperative that you don't disturbed it at this stage. The tarantula will remain on its back motionless for a while. Then you will gradually see the legs moving (slowly). Eventually the area around the carapace and along the abdomen will split and the new legs will begin emerging. It will continue to move its legs slowly until it comes completely out of the old skin (exoskeleton). This course may take from five (5) minutes with a spiderling, up to several hours with an adult. This is one of the most critical times in a tarantula's life. After molting, the spider will remain on its back for some time resting, and then eventually it will upright itself. The tarantula is very venerable at this stage, because the new skin is soft and need to harden, along with its fangs. Until then, it should not be fed or disturb. Doing this time, it will not eat. If live food is introduced at this time the predator (tarantula) may become the prey. Again, this process of the new exoskeleton hardening, takes longer with an adult than a spiderling. I have introduced prey to spiderlings a day after molting and they attacked and ate it. Adults have refused food up to a month. When I introduce food after a molt, I watch to insure that the animal is feeding; if not, I removed the food from the enclosure and introduce it a few days later. Usually after a molt, when the new exoskeleton has hardened, a tarantula will attack its prey with a vengeance. From my experience, when a tarantula reaches adulthood, the time between molts is usually one (1) year. Spiderlings and juveniles will molt more frequently. Molting is also a time of regeneration. If the tarantula has lost a limb, after a molt the appendage would have regenerated. Most of my tarantulas I have owned for several years, and have raised them from spiderlings. I also have a large collection with over one hundred (100) different species. Because all of my Ts are content in their stress free environment, none of my New World tarantulas are bald when nearing a molt, not even my Theraphosa species. Therefore I keep a record of the last two molts to determine when a tarantula is near a molt. A Curly Hair (Brachypelma albipolosum) molting. A Colombian Lesserblack (Xenesthis immanis) that recently died (DEATH CURL). All photos on this website are courtesy of Mike Basic Tarantula unless stated otherwise. It's prohibited to copy without permission of author.